Stroke-related brain damage can be assessed by studying the patient’s eyes. 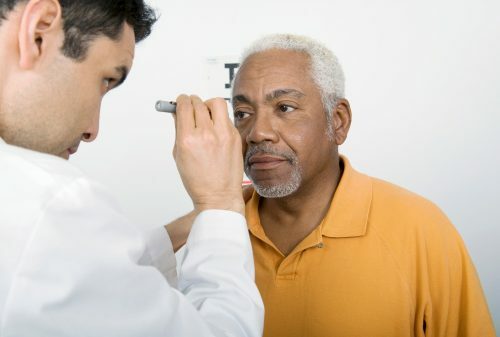 In a new study published in Neurology, researchers from the National Institute of Health (NIH) found that the eyes of stroke patients had unusual bright specks. They believe that these were caused by a chemical called gadolinium that was given to patients before brain scans. The chemical leaked into their eyes, resulting in the spots. This shows that the eyes reflect the condition of the brain. Gadolinium is an innocuous chemical that is given to patients during an MRI (magnetic resonance imaging) scan. It helps to highlight brain abnormalities so that they are visible in the scan. Gadolinium stays in the bloodstream until it is removed by the kidneys. In stroke patients, this chemical escapes into the brain in places where the blood-brain barrier (the physical barrier between blood vessels and brain tissue) is damaged. It manifests as bright spots in MRIs, which are called white matter hyperintensities. The bright spots reflect regions of brain damage usually caused due to brain aging and reduced cognitive function. Researchers at NIH’s National Institute of Neurological Disorders and Stroke (NINDS) performed MRI scans without injecting patients with gadolinium. They then compared these scans with scans taken two hours and 24 hours after administering gadolinium and compared the findings with a study of the eyes of patients. Our eyes have two main chambers that are separated by the lens and muscles. In the front, there is a section called the aqueous chamber, which is filled with a transparent watery fluid. At the back, there is a chamber called the vitreous chamber, which contains a thicker fluid. After two hours of administering gadolinium, scientists observed that the eyes of 66 percent of the stroke patients showed signs of gadolinium leakage into the eyes. At this stage, the presence of gadolinium was detected in the aqueous chamber. However, a few patients who had damaged larger regions of the brain had gadolinium present in both the aqueous chamber and vitreous chambers of their eyes. After 24 hours, this chemical had entered the vitreous chamber. At this stage, about 75 percent of the stroke patients experienced gadolinium seepage into their eyes. The presence of this was greater in patients who were older in age and had a history of hypertension. It presented as a greater number of bright spots in brain scans. In addition, it was observed in patients who were given a medication called tPA to dissolve blood clots as well as in patients who were not given the treatment. In the future, diagnosis could be based on the administration of a substance like gadolinium, which collects in the eye without affecting sight. This could eliminate the need for conducting MRIs.